DAF Trucks NV is a Dutch truck manufacturing company and a division of Paccar. Its headquarters and main plant are in Eindhoven. Cabs and axle assemblies are produced at its Westerlo plant in Belgium. Some of the truck models sold with the DAF brand are designed and built by Leyland Trucks at their Farington plant in Preston, England. In 1928, Hubert "Hub" van Doorne founded the company as Commanditaire Vennootschap Hub van Doorne's Machinefabriek. His co-founder and investor was A.H. Huenges, managing director of a brewery. Van Doorne had repaired Huenges' car several times. Huenges was so pleased with his work that he offered to finance him in business. Hub started to work in a small workshop on the grounds of the brewery. In 1932, the company, now run by Hub and his brother, Wim van Doorne, changed its name to Van Doorne's Aanhangwagen Fabriek (Van Doorne's Trailer Factory), abbreviated to DAF. Huenges left the company in 1936 and the DAF company was now completely in the hands of the van Doorne brothers. DAF developed the Trado conversions to convert 4×2 Ford trucks to an off-road 6×4 drive. 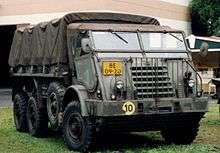 One of DAF's few armoured vehicles was the M39 Pantserwagen, using developments of this Trado drivetrain. This was too late for WWII and the invasion of the Netherlands, and only three saw combat. After the Second World War, luxury cars and lorries were very scarce. This meant a big opportunity for DAF. In 1949, the company started making lorries, trailers and buses, changing its name to Van Doorne's Automobiel Fabriek (Van Doorne's Automobile Factory). 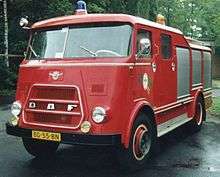 The first lorry model was the DAF A30. 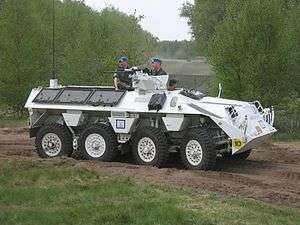 Through the 1950s, DAF was a major supplier to the re-equipping of the Dutch Army's softskin vehicles with models such as the DAF YA-126 and DAF YA-328 'Dikke Daf'. These used the all-wheel-drive H-drive developed from the Trado conversions. In late 1954, Hub van Doorne had the idea to use belt drive, just like many of the machines in the factory that were belt-driven, to drive road vehicles. In 1955, DAF produced its first drafts of a car belt drive system. Over the next few years, the design was developed and refined. In February 1958, DAF demonstrated a small belt-driven four-seater car at the Dutch car show (the AutoRAI). The public reaction was very positive and 4000 cars were ordered. In 1959, DAF started selling the world's first car with a continuously variable transmission, the small four-seater DAF 600. This was the first of a series of models to be released in subsequent years, including the DAF 33, DAF 44, DAF 55 and DAF 66, all using the innovative Variomatic transmission system. In 1967, DAF opened a new plant in Born for car production. The 44 was the first model to be produced there. 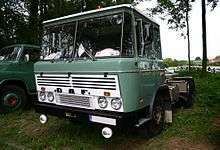 In 1972, International Harvester of Chicago, IL bought a 33% stake in DAF (with the Dutch government holding 25% and the Van Doorne family holding the remaining 42%), forming a joint-venture. This agreement lasted until 1981. DAF sold its passenger car division, along with what is now the NedCar factory in Born, in 1975 to the Swedish company Volvo Cars, leaving DAF to concentrate on its successful line of lorries. In 1987, DAF merged with the Leyland Trucks division of Rover Group and was floated on the Dutch stock exchange as DAF NV. The new company traded as Leyland DAF in the UK and as DAF elsewhere. DAF Bus was split off in 1990 to become a part of United Bus. Following difficulties in the British market, DAF NV went bankrupt in 1993. A new company, DAF Trucks, appeared in the Netherlands as a result of a management buy-out of the Dutch operations, as did Leyland Trucks and LDV (vans) in the UK. 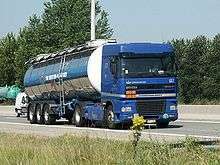 In 1996, PACCAR acquired DAF Trucks. DAF Trucks and Leyland Trucks were rejoined in 1998 when PACCAR also acquired Leyland Trucks. On 9 January 2012, PACCAR installed the cornerstone of the new plant in the city of Ponta Grossa in the state of Paraná, Brazil. The first passenger car, the DAF 600, had a unitary steel construction, with a front-mounted, air-cooled two-cylinder boxer engine driving the rear wheels through a centrifugal clutch and the Variomatic CVT transmission. The way this was constructed eliminated the need for a differential, with the drivebelts taking up the difference of speed in the corners. This acted as a limited-slip differential. The car had independent suspension all round, with MacPherson struts and a transverse leaf spring at the front, and a coil-sprung semi-trailing-arm design at the rear. The first 600s rolled off the production line in the following year. The next model was the 750, featuring a larger 749 cc (45.7 cu in) twin. Later, DAF produced a more luxurious type called the Daffodil, divided into three models assigned the numbers DAF 30, DAF 31 and DAF 32. The designation 32 was changed to 33 upon the 1966 release of the 44, a larger middle-class vehicle designed by Giovanni Michelotti. The 44 featured a completely new design aesthetically as well as mechanically, but was of the same layout as the "A-type's" (the 600,750,30,31,32 and 33), with the main difference being its 850 cc (52 cu in) two cylinder engine, and its full swingaxle rear-axle design as opposed to the A-type semi-trailing arms. The 1968 DAF 55 carried a bigger water-cooled 1,108 cc (67.6 cu in) OHV four-cylinder engine derived from the Renault 8 Cleon engine. Its body design was altered from the 44 by a new front which accommodated the longer engine and radiator, bigger taillights, and a more plush interior. The front suspension was changed from a transverse leaf spring to MacPherson struts with torsion springs and an antiroll bar. 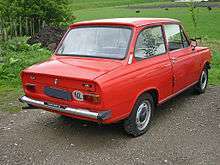 The DAF 66 was introduced as a successor to the 55. It featured new, boxy styling of the front, and a new rear-axle design. The two drive belts now powered a differential, and the axle was changed from a swingaxle design to a leaf-sprung de Dion-axle. It was a major improvement over the (tricky) handling of the swing axles of the earlier 33, 44 and 55 models. Volvo gained a 33 percent stake in DAF in December 1972, always with the intent of taking a larger interest. They increased their holdings to 75 percent on 1 January 1975, taking over the company and the NedCar plant. Volvo dropped the 33 and 44 models, and later rebadged the DAF 66 as the Volvo 66, with bigger bumpers and a safety steering wheel. The DAF 46 was developed with Volvo's assistance, and was basically a 44 with the rear axle of a 66 and a single-belt Variomatic (half the 66's transmission). A big weakness of this system is that a failed drive belt would cripple the car. The Volvo 300 series, introduced in 1976 had been designed as a DAF, with a Variomatic transmission similar to that of a 66. For a small company, DAF made a huge number of prototypes. Also, famous coach builders like Giovanni Michelotti and OSI made cars based on the DAF technique. For instance, the OSI City Car, which turned into a miniature. There was also Michelotti's "Shellette" beach car, which was later modified to use Fiat 850 underpinnings. The Dutch Royal Family used one of these at their Porto Ercole summer residence. 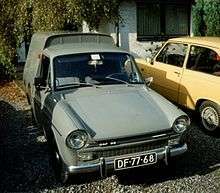 DAF's last project, the DAF 77, became the Volvo 343, which ended up selling about 1.3 million units. DAF produced their first lorry, the A30, in 1949. This lorry was upgraded in the following years. Their first attempt into the international market was a failure, the 2000DO. Their next lorry was the 1964 2600, which became a big seller with its well-equipped but practical cabin. They also produced a so-called torpedo-front tractor. In the 1970s a new modular tilting cab called the F218 was introduced on the F1600/F2000 range of vehicles. Three years later, the wider F241, which featured DAF's characteristic three-wiper windscreen, was introduced as the DAF 2800. This design lasted until the introduction of the 95 style cab in 1987. There was also a lighter, narrower version called the F198 which was introduced in 1972 on the F1200 and F1400, but this short-lived model was replaced after only three years. 1984 DAF truck production was 13,645; this increased to 14,382 in calendar year 1985. DAF was also one of the first to introduce an intercooled turbocharged diesel engine into their lorries, which in these years became very evident with their 3600. Their largest 11.6-litre (710 cu in) six-cylinder turbodiesel was based on the old Leyland O.680 motor. It was to be DAF's standard large engine long into the nineties. DAF's 95 series was launched in 1987, and quickly gained the coveted 'Truck of The Year' award. The 95 featured an all new cab developed jointly with ENASA of Spain, a revised version of the 11.6 litre ATI engine, rated at 310, 350, and 380 Bhp, and 16 speed ZF gearbox. On the Continent Eaton's Twinsplitter gearbox was an option. A full range of axle configurations were offered, to suit every operating requirement. Much attention was paid to soundproofing - the gearlinkage for example was telescopic - in-cab noise levels on the 95 put many luxury saloons to shame. An update in 1991 saw new power ratings of 329, 364, and 401 Bhp, - a 430 Bhp variant, along with low deck tractor unit models and revised interior trim, were introduced in Spring 1992. Two years later, after an intensive study of the ultra long haul market sector, DAF unveiled the 95.500 Super Spacecab at the 1994 RAI show. The 95 series cabin had gained height and length, and sat atop Cummins' 14 litre N14, rated at 507 Bhp. ZF's new Aluminium-cased 16S221 gearbox was fitted, with optional Intarder, an innovation was the hydraulic gearshift developed with Konsberg of Norway. Within an overall height of 3.85m, the Super boasted an interior standing height of 2.25m, a luxury bunk with generous stowage underneath and a full range of options included microwave, fridge, TV/Video. The 95.500 was available as a 4x2 tractor or drawbar rigid, with LHD only, though the Super Spacecab was available on 11.6 litre-engined models, and sold well. The 95.500 is now a very rare truck, which I find surprising given the original list price of £87, 650. The basic cab design remains in production to this day, latterly as the 95XF and now the XF105, although both these developments of the original 95 are totally different machines under the skin. Other vehicles in the DAF range have included the inherited from Leyland Trucks Roadrunner (Badged DAF 600, 800, 1000 On the Continent) which evolved into the 45 Series, the cab of which was used on the 18 ton gross 55, also as a military spec 4×4. An all-new medium to heavyweight line up debuted in late 1992, the 65, 75 and 85 utilising the same wedge shaped cab. Powered by DAF's 6.24-litre (381 cu in), 8.65-litre (528 cu in) and 11.6-litre (710 cu in) engines, some novel styling details featured, while the 85 Series' cab sat 10 cm (3.94 in) higher on the chassis to clear the WS engine. A short-lived model was the 1990-93 80 Series using the T45 Roadtrain cab acquired from the Leyland Trucks takeover, fitted with the ATI driveline. Also offered for a short period was the 3200, basically a remodelled 2800 with the corporate style, three-bar grille. There is a DAF LF45 hybrid version, which was presented by DAF at the IAA 2010 in Hannover. In August 2011, DAF announced it had built up a 19% stake in Tatra, which will use DAF cabs and PACCAR engines. DAF dealers will sell Tatra off-road lorries. DAF cars had the image of being slow. The company tried to change this image with entries in rallies and races, such as their entry in the London-Sydney Marathon. They were pioneers with continuously variable automatic transmission called Variomatic. 1980s: DAF lorries started competing in the Dakar Rally, winning in 1982, 85 and 87. In the later years, they competed with a twin engine lorry, producing a combined power output of more than 1,000 PS (740 kW). 1988: Two lorries were entered into the Paris-Dakar rally. Jan de Rooy's lorry was running third overall, beating the Peugeot 405 T16's on speed, when DAF's other lorry, driven by Theo van de Rijt, was involved in a crash. His co-driver Kees Van Loevezijn was fatally injured and the other 2 occupants of the lorry narrowly escaped the same fate. DAF withdrew from the event following the crash. 1996: DAF started competing in the European Truck Race series, first not very successful, but by 1999 almost became champions. Then to everyone's surprise, they withdrew. 2002: DAF competed in the Dakar Rally, with Jan de Rooy and his son Gerard. 2003: DAF competed in the Paris-Dakar rally, winning numerous stages before Gerard de Rooy crashed. 2004: DAF competed in the Paris-Dakar rally, powering six racelorrys. Jan en Gerard de Rooy, the team Tridec, The team Hans Bekx with 2 lorries and the GINAF Rally Power team (Note that 4 lorries were built by DAF, 2 by GINAF). 2005: Hans Bekx almost finished second overall in the lorry division, before being removed from the competition because of an irregularity, much to the surprise of the (mostly Dutch) fans. 2006: Jan and Gerard de Rooij were excluded from the Dakar because of paperwork issues. ↑ Between Initiation and Innovation: Transfer and Hybridization of Productive Models in the International Automobile Industry. Oxford University Press. 1998. ISBN 0-19-829368-2. ↑ Kennett, Pat, ed. (September 1982). "Eurotest". TRUCK. London, UK: FF Publishing Ltd: 51. ↑ Barden, Paul, ed. (June 1986). "Truckmonth: Briefly". TRUCK. London, UK: FF Publishing Ltd: 27. 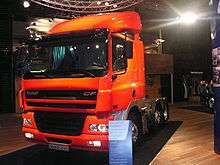 ↑ "DAF Trucks at IAA 2010". DAF Trucks N.V. 21 September 2010. Archived from the original on 24 September 2010. Retrieved 2 October 2010. ↑ "DAF Trucks grabs 19% stake in TATRA and supplies engines and cabs for new range! Biglorryblog has the story...". 3 August 2011. Archived from the original on 28 August 2011. Retrieved 3 August 2011. Wikimedia Commons has media related to DAF Trucks.